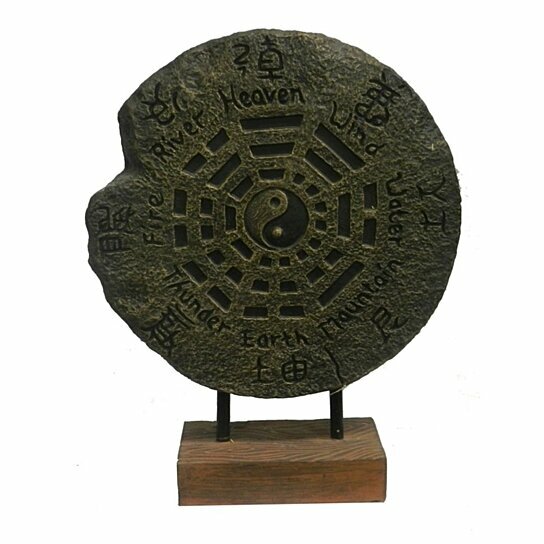 Have a glance at this eight elements table decor, which is crafted to offer meaningful touch. This decor is made from Polyresin and the base is wooden. At the center the circle sign is called, ?Yin Yang?. This represents the concept of duality forming a whole. It will be fruitful for the ambiance of the house. This meaningful decor can be part of drawing room, study room or office desk. Built nicely from the finest material they ensure long lasting life. Suits home and office decor. Includes eight elements i.e. heaven, wind, water, mountain, earth, thunder, river and fire. Will go beautifully well with any themed home.